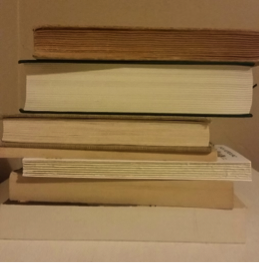 The immediacy and profundity of the contemporary environmental crisis compels the support of a higher education curriculum and pedagogy that becomes more sympathetic to understanding and addressing environmental problems and issues. Colleges and universities need to produce students who are capable of acting responsibly toward the environment. Courses across disciplines will need to contribute to developing and encouraging critical thinking, problem-solving, awareness, motivation, and sensitivity amongst students to promote action toward environmental improvement. By nurturing a more comprehensive emphasis on cultivating environmentally literate learners, with the knowledge, dispositions, competencies, and behavior to create meaningful ecological, political, economic, social, and cultural change, higher education may become better poised to provoke and maintain the necessary environmental response. The urgency inspiring this response suggests that higher education needs to continue to implement the principles, methods, and goals of environmental and sustainability education. While differences existence between environmental education and sustainability education, their overlap as perspectives of pedagogy emphasizing pragmatic understandings and actions toward the natural world unites them. Even as environmental and sustainability education differentiate themselves (environmental education more heavily focused on knowledge, skills, and behavior development, while sustainability education values the added dimension of social justice), they blend as approaches to foster positive action and change. This progress is already being accomplished on campuses across the United States and the world. According to the 2014 report of the Association for the Advancement of Sustainability in Higher Education (AASHE, 2014), there were 1,274 programs of study in the United States focused on environmental or sustainability education. This number, along with the number of institutions participating in AASHE’s STARS program (the Sustainability Tracking, Assessment, and Rating System used by higher education institutions to track their progress towards sustainability) continue to increase each year, as the sustainability movement gains in prominence throughout higher education. The advancement of environmental and sustainability education is encouraging, as Fisher and McAdams (2015) suggest that mere exposure to environmental content is more important to developing students’ concepts of sustainability than even continued exposure. Even with all of the growth of environmental education-based ideas within the higher education context, the question remains as to whether instructors are merely teaching about the environment or if they are also teaching for the environment. A need to comprehend the approaches and outcomes of environmental education in higher education has emerged. This study sought to understand the impact of environmentally themed higher education courses on the environmental literacy of students. Specifically, the study researched the changes in students’ self-perceptions of their environmental literacy over the course of a semester in an environmentally themed course through a pre- and post-test format. The study also inquired as to the emphasis of instructors on environmental literacy aspects within their course objectives. This information has allowed for a deeper understanding of higher education efforts and outcomes regarding environmental literacy, a specific measure to assess the status of environmental education outcomes at the higher education level. The broader purpose of this study, beyond measuring changes in environmental literacy, is two-fold. First, the study seeks to analyze where environmental education sits within sustainability movements on higher education campuses; and, secondly, the study seeks to discover what the role of environmental education might be in advancing the necessary movement within and outside of the classroom. Research has shown that academics are supportive of infusing their curriculum with sustainability concepts (Christie et al. 2015). But conversely, the outcomes, not to mention the objectives, of these efforts to implement a form of environmental education are often varied (Mintz & Tal, 2014). Thus, students are exiting environmentally themed courses with a lack of integrated understanding, such as the inability to connect sustainability issues and resolutions across disciplines, of the very concepts the courses are trying to teach (Fisher & McAdams, 2015). These findings lead to a paradoxical and ambiguous standing for the field of environmental education in higher education. This study, by measuring the development of environmental literacy in students, strives to determine if the efforts already being made have been effective and ponders how they can increase their effectiveness and efficiency. Previous research has suggested that environmentally themed courses can develop environmental literacy, but the results are mixed. Moody’s (2006) study of students at the University of Georgia saw significant increases in students’ knowledge and awareness of environmental issues. This study sought to expand on Moody’s findings about the development of knowledge and awareness by also focusing on dispositions and competencies. Additionally, Moody’s study produced contrasting conclusions about the impact of environmentally themed courses on students’ behaviors. While students perceived themselves as improving their environmentally responsible behaviors, campus faculty maintained that the student body remained primarily environmentally illiterate (Moody, 2006). The inconclusiveness of Moody’s study suggests that this study will shed further light on the development of environmental literacy in environmentally themed higher education courses. How are environmentally themed higher education courses impacting students’ self-perceptions of their environmental literacy? How does pedagogical perspective relate to students’ self-perceptions of their environmental literacy in environmentally themed higher education courses? How are instructors emphasizing environmental literacy in environmentally themed higher education courses? To respond to these questions, this exploratory study employed convenience sampling to determine its population. Participants for the study were derived from the population of students and instructors of semester-long environmentally themed courses at Wisconsin colleges and universities. In total there were 871 students and 18 instructors from 19 courses at 8 universities. Specifically, the courses relevant to this population were selected by the inclusion of the term “environment” in their name or in the department or discipline they were being offered in. The participants were divided into three pedagogical perspectives to allow for a comparison between approaches to environmentally themed content. The three pedagogical perspectives were: ecological science-based, humanities and social science-based, and integrative environmental studies. From the Hollweg et al. (2011) environmental literacy framework each component, grouped into the four aspects of environmental literacy, was derived into an item for the Student Survey, with the exception of the components of political action and legal action. These components were not included because of potential ethical dilemmas in presenting these items to student participants. The statements from the Hollweg et al. 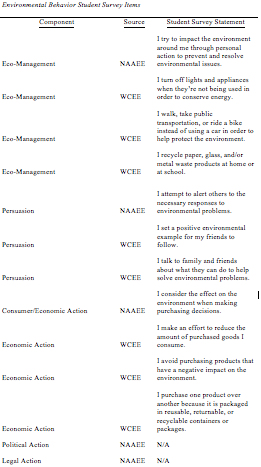 (2011) framework for environmental literacy were supplemented by statements, presented in a similar format, taken directly from the Wisconsin Center for Environmental Education’s (WCEE) environmental survey of high school students (1997). Statements from the WCEE survey were included concerning the following Hollweg et al. 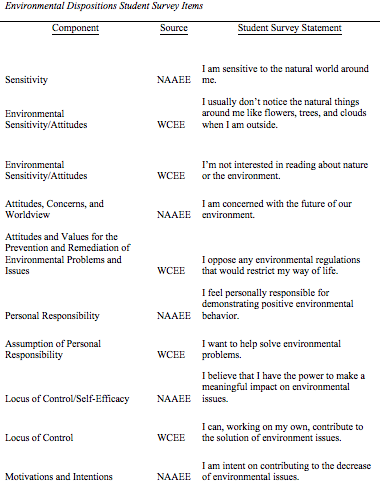 (2011) environmental literacy framework components: sensitivity, attitudes, personal responsibility, locus of control, eco-management, persuasion, and economic action. 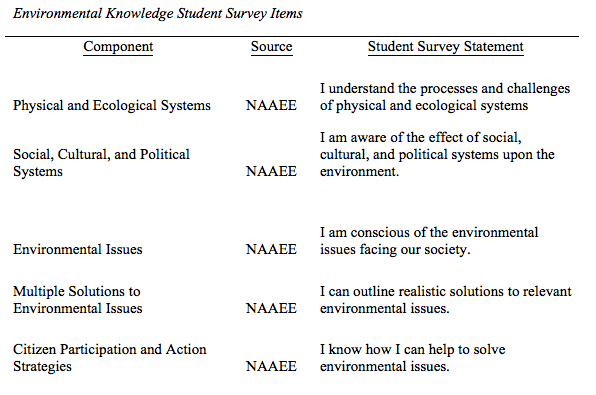 The items are presented in the tables below by the different aspects of environmental literacy: knowledge (Figure 1), dispositions (Figure 2), competencies (Figure 3), and behavior (Figure 4). Participants completed the survey on a Scantron form to allow for ease of completion and data recording. Beyond responding to all of the statements, participants were also asked to provide their gender and major. The Student Survey pre-test was conducted in class during the first two weeks of the Fall 2014 semester, with the post-test conducted in class during the last two weeks of the semester. 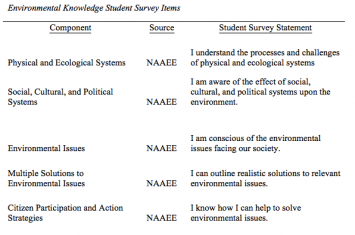 The Student Survey employed a nine-point Likert scale for the measurement of students’ self-perception of their environmental literacy. On the scale, 1 represented the lowest score with 9 being the highest score. Only the end and middle values (1, 5, and 9) were defined for the participant to allow for more meaningful interpretation within the scale. The second research instrument, an Instructor Reflection, asked instructors to rate the strength of emphasis placed on environmental literacy components in their courses. The items again reflected the Hollweg, et al. (2011) framework of environmental literacy. The reflection was completed in October and November 2014 through an online survey. In the Instructor Reflection, participants were asked to rate the degree of emphasis in their course on environmental literacy aspects and components. For each aspect of environmental literacy, participants rated their emphasis of the components of environmental literacy on a four-point Likert scale as either little or no emphasis, minor emphasis, major emphasis, or primary emphasis. The instructors also responded to a question concerning the goals, objectives, and intended learning outcomes of the course. Data from the two research instruments (Student Survey and Instructor Reflection) were analyzed using several methods to respond to the study’s research questions. Data from the Student Survey were analyzed through paired samples t-test and one-way ANOVA statistical testing in SPSS. The paired samples t-test measured the changes of students’ self-perceptions of their environmental literacy from pre- to post-test. 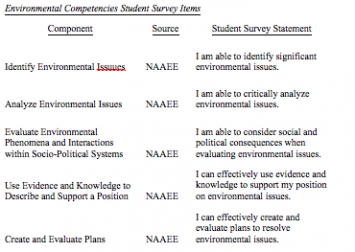 These differences were analyzed in regards to each statement from the Student Survey, as well as the groupings of the four aspects (knowledge, dispositions, competencies, and behavior) of environmental literacy. The one-way ANOVA, including a Tukey HSD post-hoc test, measured the variability existing amongst difference scores. Specifically, these differences were measured for each of the aspects of environmental literacy, as well as overall scores, to compare the variance between the separate pedagogical perspectives. Information from the Instructor Reflection was analyzed using descriptive statistics, as well as coding of the open-ended answers to the Hollweg, et al. (2011) framework. Preliminary data analysis was conducted to ensure the validity and reliability of the Student Survey. This included a review, pilot study, testing for Cronbach’s Alpha, and factor analysis. The factor analysis consisted of an unrotated principle component analysis and factor loading with a scree plot evaluation to determine the component score for each item in the four aspects (knowledge, dispositions, competencies, and behavior). Data also provided information about the total variance explained by the primary factor of each aspect. The initial eigen showed that each aspect was primarily explained by the appropriate latent construct, with the first factor explaining 65.305% variance of knowledge, 54.162% of dispositions, 80.221% of competencies, and 67.369% of behavior. 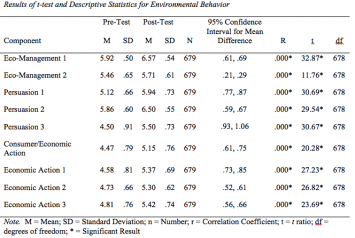 This portion of the factor analysis determined that each environmental literacy aspect was primarily associated with a single factor, suggesting each scale’s reliability as a measure of that environmental literacy aspect. While most items received factor loading scores of greater than .8, four items were dismissed because of a factor loading of less than .6. Two items were removed from the dispositions subset: one of the environmental sensitivity/attitudes items and the item concerning attitudes and values for the prevention and remediation of environmental problems and issues. Two items were also removed from the behavior subset for low factor loadings, both eco-management items. The factor loadings of these items demonstrate that nearly all items were valid measures of the construct they were determined to measure. Additionally, Cronbach’s alpha scores for the reliability of both the pre- and post-test demonstrated a high reliability (greater than .850) for each of the aspects. 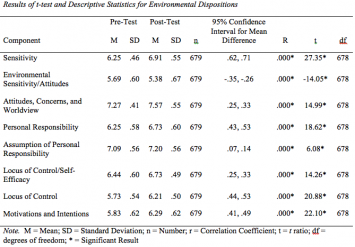 The results from the paired samples t-test show that environmentally-themed higher education courses are having a significant positive impact on students’ self-perceptions of their environmental literacy. 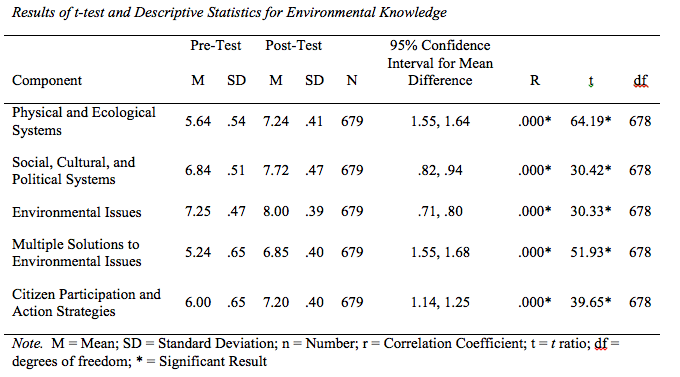 The overall positive change in environmental literacy, taken from an average of all items from each section, achieved a significance level of t (678) = 39.53, p < .001. Across each aspect, there was a significant positive change in environmental literacy scores between pre- and post-test. 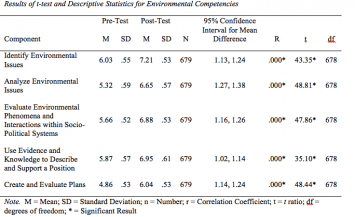 The results of the t-test and descriptive statistics for each of the environmental literacy aspects (knowledge, dispositions, competencies, and behavior) are presented in Table 1. The trend of significant change from pre- to post-test suggested by the paired samples t-test was matched by significant changes in nearly every environmental literacy component in a separate t-test. Overall mean scores were established from the average of each section’s pre- and post-test scores. Every component of knowledge, competencies, and behavior had a significant positive change from the beginning to the end of the environmentally-themed course. 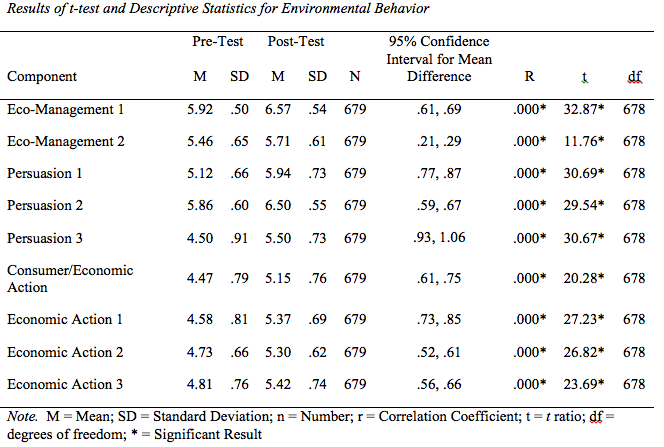 Each component of dispositions was significant as well, however the item environmental sensitivity/attitudes was significant for a decrease in mean scores, t (676) = -14.05, p < .001. The results of the t-test for knowledge (Table 2), dispositions (Table 3), competencies (Table 4), and behavior (Table 5) are presented below. While differences between pre- and post-tests were statistically significant for each aspect, there appeared to be a difference between which aspects changed at a greater rate than the others (Figure 5). Knowledge and competencies consistently exhibited larger growth than dispositions and behavior across each pedagogical perspective. Figure 5: Aspect difference scores by pedagogical perspective. While the Hollweg et al. (2011) framework emphasizes the importance of competencies in resolving environmental issues and knowledge remains the basis for awareness and values regarding the environment (Stern, 2000), the smaller gains in dispositions and behavior are cause for examination. If environmentally-themed higher education courses are not provoking students to care about the environment at the same rate as they are disseminating knowledge and competencies, perhaps students are less likely to employ their understandings and skills in environmentally responsible behavior. Although it is possible students in these courses entered with a greater disposition towards environmental issues, the lack in development of care towards the environment suggests a minimal advancement toward action being inspired in the students. Considering environmentally responsible behavior, the ultimate expression of environmental literacy, as the goal of environmental education, it seems that environmentally-themed higher education courses are perhaps indirect purveyors of environmental knowledge and competencies and not founded in the principles of environmental education. 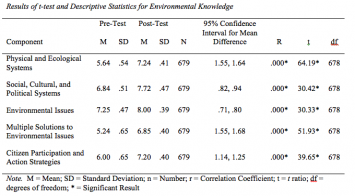 The results of the one-way ANOVA, responding to the second research question, detected a significant main effect for each aspect, including overall scores, of environmental literacy. Using a Tukey HSD post-hoc test to sort out the variance of difference scores amongst pedagogical perspectives, it was determined there was a significant difference between pedagogical perspectives. 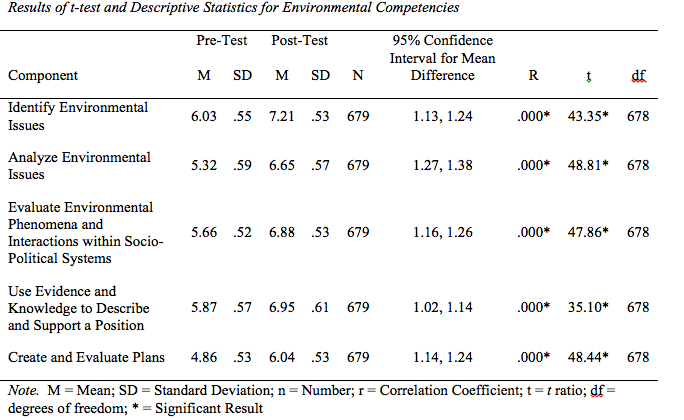 Overall scores of environmental literacy changed significantly more for students in integrative environmental studies courses (M = .80) from pre- to post-test. Ecological science-based courses (M = .70) also had a greater growth in environmental literacy than humanities and social science-based courses (M = .35). 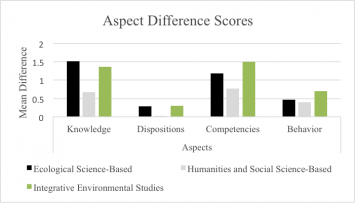 Humanities and social science-based courses demonstrated the smallest difference scores between pre- and post-test at a significant level for each aspect of environmental literacy. Conversely, integrative environmental studies courses produced significantly larger change scores than the other pedagogical perspectives for both competencies (M = 1.37) and behavior (M = .69). The results for the second research question, concerning the influence of pedagogical perspective on changes in students’ self-perceptions of their environmental literacy, suggest that pedagogical perspective is influential on the amount of change for each environmental literacy aspect. While this study did not evaluate what the primary differences in pedagogical perspective were (other than instructor emphasis ratings for environmental literacy aspects and components as explained with the discussion of Research Question 3), results of the one-way ANOVA and Tukey HSD post-hoc tests demonstrate that something is different between these pedagogical perspectives, at least in their impact on students. Yet, this finding does not attempt to evaluate the effectiveness of the varying pedagogical perspectives. Instead, the significant variance in changes highlights the inherent diversity of pedagogical perspectives. The data collected from the instructor reflection were analyzed using descriptive statistics to present information about instructor emphasis of aspects and components in each pedagogical perspective. Although the data were not statistically tested beyond basic descriptive statistics, there are a few trends worth noting. 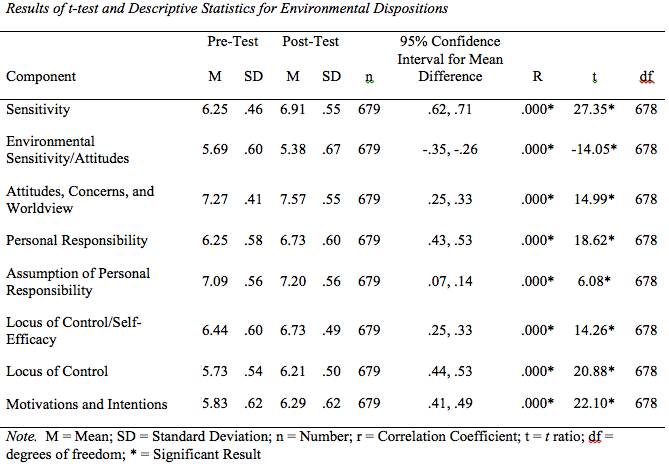 Allowing for the subjective nature of the rating scale, the integrative environmental studies pedagogical perspective had the highest emphasis ratings for each aspect. Despite this trend, the scores of emphasis were rather similar across pedagogical perspectives, with differences in scores occurring mostly within aspects and not between groups. The overall scores, based on the four-point Likert scale participants responded to, demonstrated that instructors emphasized behavior (M = 2.08) less than knowledge (M = 2.83), dispositions (M = 2.61), and competencies (M = 2.80). Data on the instructor emphasis scores of each pedagogical perspective is presented in Table 6. Among the results, instructors’ lack of emphasis on behavior components of environmental literacy compared to the other aspects is most significant for the status of environmental education in higher education. Perhaps the lack of emphasis placed on behavior by instructors is a reason for the relatively lower growth in behavior self-perceptions compared to the other aspects. The reason for a lower emphasis of behavior, especially while the other three aspects are similar across disciplines, remains unclear, but there are several suggestions. A primary reason for a lack of behavior emphasis could be instructors’ tentativeness, verging on unwillingness, to call students to action, instead attempting to remain objective purveyors of knowledge. This has been a traditional concern for environmental education (Hug, 1980), but one that suggests the difficulty in inspiring behavior change. Another potential reason for a lack of emphasis on behavior is the fact that behavior is exhibited after or outside of the classroom. Instructors face an extracurricular challenge in attempting to provoke behavior change while still imparting the understandings and skills that their content and approach seeks to have students master. Perhaps instructors need to consider how to empower behavior change through action-oriented and issue investigation-centered curriculum, which prioritizes the development of environmentally responsible behavior in students (Hsu, 2004). This study has endeavored to discover possibilities for appropriate goals, methods, and outcomes for environmental education within the context of higher education and in its pursuit of environmental literacy and environmentally responsible behavior. This study affirms the relevance and necessity for environmental education to cultivate environmental literacy in learners, resulting in environmentally responsible behavior. The environmental crisis faced and exacerbated by our individual and collective decisions compels the capacity to consider the ecological, social, political, economic, and cultural forces that shape our world and ensure they are in accordance for a “dynamic equilibrium between the quality of life and quality of the environment” (Hungerford et al., 1980). Even though this study shows that environmentally-themed higher education courses are positively impacting students’ self-perceptions of their environmental literacy, it remains to be asserted how pervasive environmental education is in this process. If the ultimate objective of environmental education is to inspire environmentally responsible behavior, this study suggests that environmental education is not being explicitly practiced in environmentally-themed higher education courses. While the courses demonstrated a positive effect on environmental literacy, including behavior, the lack of instructor emphasis on behavior components of the Hollweg et al. (2011) environmental literacy framework shows environmental education is not the primary focus of these instructors. This study corroborates and expands on past research that suggests that instructors most emphasize theoretical knowledge in environmentally themed higher education courses (Mintz & Tal, 2014). In the case of this study, it is not what instructors are emphasizing that is most important but what they are not: behavior. The approaches taken by instructors are excluding behavior change as an objective, teaching about the environment but not for the environment. In a world that requires environmental literacy, environmentally-themed higher education courses need to embrace environmental education principles, such as emphasizing behavior change, which make the curriculum more dynamic and effective. However, advocacy in the higher education classroom is a complex issue. Affirming the need for education in support of environmentally responsible behavior simultaneously validates the advocacy for opposing opinions and actions. As educators seek to inspire their students to do what is right in the world, they realize that what is right has many definitions to many different people. But environmental education has never excelled as a majority perspective or the consensus of the masses. Instead, environmental education has been sustained and advanced by the passionate and determined voices of an ambitious few. Perhaps this study serves to suggest the deepened need for the continued energy of those voices in a time of political, social, and environmental upheaval. There are vital possibilities for those voices to speak up in this crucial time, which should not be characterized by desperation, but by decision and action. Higher education courses may not be the ideal setting for these discussions or advocacy, but it may be one of the only options left. If society is to compose a conscious response to the ecological challenges confronting us, perhaps we must surrender the values of past paradigms and embrace principles that better encourage open-mindedness, creativity, responsibility, and passion. This issue deserves more exploration, but this study poses questions about the extent that behavior advocacy is already occurring and is possible in the future. This study, amidst questions of the proper role of environmental education and education for sustainability, provides hope. Even as the results of the study show behavior as emphasized the least of the four aspects of environmental literacy, there were significant positive advances in students’ self-perceptions of their environmental knowledge, dispositions, competencies, and behavior. The significant growth in students’ self-perceptions of their behavior, as well as significant growth of environmental competencies, depicted in this study compared to Moody’s (2006) study, provides a clearer idea of the power and possibility of environmentally themed higher education courses. Additionally, this study’s insight into differences of pedagogical perspective begins a trend towards what is hopefully more profound analysis and detailed demographic division to better understand the outcomes of environmentally themed courses. This research advances on the findings of Fisher and McAdams (2015) by differentiating the type of impact made in these courses beyond mere exposure. By analyzing both the outcomes and approaches apparent in environmentally themed courses, this study uniquely offers a more extensive perspective on the role and impact of environmental education in higher education. Ultimately, this study shows that environmental education can be successful in the higher education curriculum, even if manifested indirectly through the variety of environmentally-themed courses. By adopting environmental education principles, methods, and objectives in environmentally-themed higher education courses, gains in environmental literacy may be even greater. Scholars (Fisher and McAdams, 2015) have already noted the flexibility and possibility inherent in environmental education infusions to the higher education curriculum. As this study demonstrates, environmentally themed courses are achieving significant development of environmental literacy. This study offers quantitative findings that assert the positive impacts and possibilities that environmental education principles can lead to for higher education students. By fostering the environmental knowledge, dispositions, competencies, and behavior that are vital to successful and sustainable responses to the manifest ecological challenges, environmentally themed courses can improve the skills and motivations of learners to impact change beyond the scope of higher education. While this study has forged significant new understandings concerning the connection between environmental education and environmentally themed higher education courses and their cultivation of environmental literacy, future research is necessary for further advances. A long-term assessment of environmental literacy creation inspired by environmentally themed higher education courses is necessary to understand the development and sustaining of environmental literacy. Particularly, future assessments of environmental literacy development in higher education could focus on the interaction between the different aspects of environmental literacy. This research could be tied to an evaluation of environmentally themed higher education courses, focusing on their integration of environmental and sustainability education. This would entail an in-depth assessment and critique of teaching methods, curriculum, intended objectives, and course outcomes. Future research must also be dedicated to measuring shifts in dispositions of students, as well as the fostering of environmentally responsible behavior in the short- and long-term. As these endeavors of future research evolve, they must ultimately remain grounded in the pursuit of discovering best practices for environmentally themed higher education courses. While this study shows significant growth occurring in environmentally themed courses, there remains work to be done in higher education. Beyond the challenges of bureaucratic obstacles and inaccessible portions of the higher education population, the results of this study suggest that the tenets of environmental education can become more prominent in the classroom. Higher education can be responsive to the current ecological crisis by producing students with the knowledge, dispositions, and competencies to enact meaningful behaviors. This is not an easy task. Provoking behavior change in learners remains challenging and controversial. Yet higher education should seek to empower students with hope, inspiration, and opportunity, while arming them with the skills necessary to create change. By further developing and refining the integration of environmental and sustainability education, instructors can reach their students in more comprehensive and stimulating manners. The message that this research culminates in is that not only are environmentally themed higher education courses producing successful outcomes, but there are more opportunities for environmental education to expand so that it may compel us to act passionately, urgently, and profoundly in the face of current and future ecological challenges. Association for the Advancement of Sustainability in Higher Education (AASHE). Annual Report. 2014. Christie, B.A. et al. (2015). “Environmental sustainability in higher education: What do academics think?” Environmental Education Research, Vol. 21 No. 5, pp. 655-686. Fisher, P.B. & McAdams, E. (2015). “Gaps in sustainability education: The impact of higher education coursework on perceptions of sustainability.” International Journal of Sustainability in Higher Education, Vol 16 No. 4, pp. 407-423. Hollweg, K.S. et al. (2011). Developing a Framework for Assessing Environmental Literacy, North American Association for Environmental Education, Washington, D.C.
Hsu, S.J. (1998). “An assessment of environmental literacy and analysis of predictors of responsible environmental behavior held by secondary teachers in the Hualien area of Taiwan.” Environmental Education Research, Vol. 4 No. 3, pp. 229-249. Hungerford, H.R. et al. (1980). “Goals for curriculum development in environmental education.” The Journal of Environmental Education, Vol. 11 No. 3, pp. 42-47. Hug, John (1980). “Two hats.” Science Activities: Classroom Projects and Curriculum Ideas, Vol. 17 No. 2, pp. 24-24. Mintz, K. & Tal, T. (2014). “Sustainability in higher education courses: Multiple learning outcomes.” Studies in Environmental Evaluation, Vol. 41, pp. 113-123. Moody, G.L. (2006). Evaluating the University of Georgia’s environmental literacy requirement, University of Georgia, Athens, Georgia. Stern, P.C. (2000). “New environmental theories: Toward a coherent theory of environmentally significant behavior.” Journal of Social Issues, Vol. 56 No. 3, pp. 407-424. Wisconsin Center for Environmental Education (WCEE) (1997). Environmental survey of high school students in Wisconsin, Wisconsin Center for Environmental Education – University of Wisconsin-Stevens Point, Stevens Point, WI.